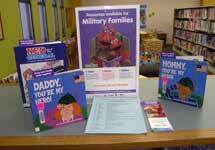 Area military families with preschool children have a new set of resources at the Oshkosh Public Library designed to help them face the challenges of deployment and stay connected with loved ones who serve. These books, DVDs and other resources address important issues such as staying connected with family members stationed far from home, expressing feelings, coping with deployments and homecomings and dealing with grief.These books, DVDs and other resources address important issues such as staying connected with family members stationed far from home, expressing feelings, coping with deployments and homecomings and dealing with grief. The program, Wisconsin Public Television Supports Military Kids, is a partnership of Wisconsin Operation Military Kids (4-H), the University of Wisconsin Extension, Wisconsin Library Association and Wisconsin Public Television. Visit the lower level Children's Department to check out the collection. Additional online resources are available at FamiliesNearAndFar.org, a free bilingual social networking web site designed to help bring military families closer together.